This trio of promotional products was given out at a Verizon store in New York to any existing customers interested in upgrading their phones. It’s a classic use of a free giveaway to put the customer in a positive mood and a more receptive state of mind. And of course, it’s a nice opportunity for Verizon to turn some of their customers into walking billboards! It’s not a bad selection of products either – the imprinted hand warmers, although temporary, are a great item to group with the logo winter hat for customers sick of the cold New York weather. Verizon chose to round out the promo package with a simple imprinted pen that delivers branding exposure inside the home or office. 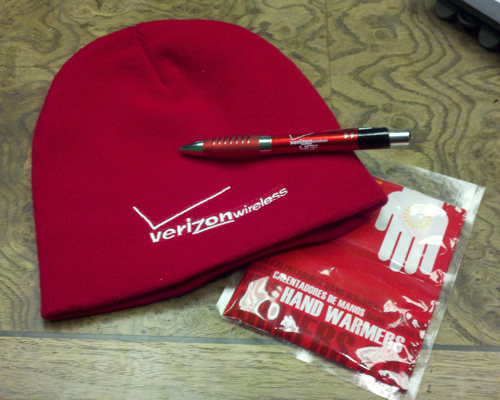 Overall it’s a simple and effective giveaway kit that provides some useful value to customers while also promoting Verizon’s brand recognition and customer satisfaction efforts in the process.